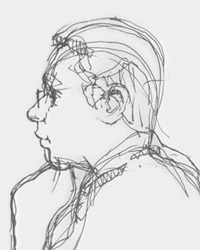 Welcome to andrzejb.net - the on-line presence of Andrzej Borzyskowski. This website serves as an abbreviated on-line CV and a portfolio of a selection of my previous work including commercial projects, cultural projects, some student works and research. Situated in Perth, Western Australia I have primarily worked as a multimedia designer and government officer performing specialist work in electronic media and information management. I have experience in data and information analysis, investigation, research, documentation and presenting information through the use of various information delivery methods. I have experience in maintaining statistical and database records and using various records management and database software applications with a focus on information quality assurance. My multimedia skills and experience include imaging, graphic design, web design, motion graphics, 3D modelling and animation, photography, videography, video and audio digitisation, capture, editing, production and output. I have conducted work for various organisations, businesses, individuals and for government in the diverse fields of art and design, history and culture and law and justice. I particularly enjoy using my skills to benefit disciplines and areas that are of interest to me. One such example has been to volunteer my skills for the benefit of cultural heritage, as much of the work on this website demonstrates. As my career has progressed I have developed an increased humanitarian outlook and I am currently studying a Diploma of Mental Health with the intention to work in the community services field in the near future. Received the State Library of Western Australia ‘Terry Campbell Award for Service Excellence’ for work carried out in the Oral History Records Rescue Group (OHRRG) Audio Technician Team. Invited to participate at the 5th Biennial Tehran International Animation Festival held in Tehran, Iran with the 3D animated cultural film ‘Lech, Czech & Rus’. Inducted into the Golden Key International Honour Society due to high academic achievement. 3D animated ‘Showreel’ nominated for Best Animation & New Media at the 15th Film & Television Institute (FTI) WA Screen Awards (1 of 3 finalists). ‘Showreel’ consisted of two 3D animated films including the cultural film ‘Smok Wawelski - The Legend of the Wawel Dragon’. Listed below are various research projects, articles and reports that I have carried out - both academic and personal. These are discussed in greater detail in the Research section of this site. 100,000 word dissertation completed as part of Bachelor of Arts in Design, which received 1st Class Honours. The project included a presentable prototype of a 3D animated cultural film ‘Lech, Czech & Rus’. (Please see the Animation section of this website for images of the film). This was a rough information resource I created for myself when I was active on Slavic culture forums and working on my 3D animated cultural films. It contains information from a wide variety of sources and details the origins of the Slavs and the great Slavic mass-migrations. The page was first placed on-line at the beginning of 2003. Web page about the origins and history of my family name ‘Borzyskowski’. The information contained in the page was originally compiled in 2007 and placed on-line in 2008. Served the Western Australian Polish community during this period by carrying out graphic design, website design and maintenance for the Polish club and community centre Cracovia Club Inc. Received interest from the cultural organisation Canadian Slav Committee about co-operating on Slavic cultural issues. I became an honorary member of the organisation. Based in Toronto, Canada, the Canadian Slav Committee is closely affiliated with other Slavic cultural organisations within Europe and was represented at the 9th All-Slavonic Congress held in Minsk, Belarus in July 2005. Received interest from the cultural organisation Mt Kosciuszko Inc., about the possibility of continuing my series of animated films. I had the opportunity to carry out a lecture discussing my cultural work and a presentation of my films. Carried out website design, graphic design, videography and music and video editing for the cultural dance ensemble Young Mazowsze Polish Folklore Theatre. Young Mazowsze was established in 1970 in Western Australia by its artistic director Longin Szymanski and named in honour of Poland’s famous professional dance ensemble ‘Mazowsze’ for whom Longin Szymanski danced professionally for 10 years. Listed below in chronological order is an abbreviated employment history, a selection of projects that I have worked on and various work-related pursuits and activities. Some of the creative projects mentioned are displayed and discussed in greater detail in the relevant sections of this website. As part of the supervised field placement unit for the Diploma of Mental Health I carried out work placement at Midlas (Midland Information Debt and Legal Advocacy Service Inc). Midlas is a community service agency that performs a broad range of community service work including financial counselling, tenancy advocacy, disability advocacy, family and domestic violence legal support and emergency relief. Upon the conclusion of the work placement I carried out volunteer work for the agency. Work included information management, research, design and client advocacy. Worked on several freelance website design and maintenance projects for various organisations, businesses and individuals, including: Ravensthorpe Regional Chamber of Commerce Inc.; Sizer Builders & Sizer Developments; and a collaborative website design project ‘Transgressions of Domestic Space at Wedge’, which presented a university academic’s research work and complemented their exhibition displays concerning Wedge Island, Western Australia. (See the Design section of this website for more details). Worked collaboratively with well-known Western Australian artist Ben Joel. The work included creating digital versions of his artworks - in the form of two 3D animated films and a number of prints. These were displayed at the John Curtin Gallery as part of Ben Joel’s exhibition ‘Instrumental’, on display 16th September - 9th December 2005. (See the Animation section of this website for more details). Tutoring job teaching design software skills to individuals, primarily Adobe Photoshop. Completed a 100,000 word dissertation entitled ‘An Approach to Independent 3D Animation Production’ as part of Bachelor of Arts in Design, which received 1st Class Honours. The project included a presentable prototype of a 3D animated cultural film ‘Lech, Czech & Rus’. The aim of the Honours project was to investigate the feasibility of creating a 3D animated series as an independent animator. This was carried out through researching independent animation production and undertaking the animation process involved in the production of a presentable prototype of a pilot episode for an animated series, following the independent film-making production model. (See both the Research section and Animation section of this website for more details). Completed the 3D animated cultural film ‘Smok Wawelski - The Legend of the Wawel Dragon’ for the 3rd year university Multimedia Major project. This was included as part of the ‘Showreel’ nominated at the 15th Film & Television Institute (FTI) WA Screen Awards in 2002. (See the Animation section of this website for more details). Performed video capture and video editing for multimedia company Q-Multimedium for English ‘Super League Rugby’ interactive CD-ROM project. Completed CD album and booklet design for local Perth musician Keith McDonald. Credited work for Gripping Films & Graphics as a trainee animator performing 2D computer animation on ‘Bobtales’ - a television series on Aboriginal Dreamtime stories. First screened in Australia on SBS Television in 1998, it has been screened internationally in countries such as Taiwan and Norway. (See the Animation section of this website for more details).